In a bind to get a side dish for the in-laws tout de suite to go with their traditional Christmas roasted orange glazed duck, the Chef whipped up an impromptu tasty yam dish. Trying to find something open on Christmas day is such a hassle, so the Chef dug deep through what was on hand -- a left-over whiskey airline bottle from his "Egg Nog & A Tipsy Tree Trimming" video from last week, a package of pumpkin seeds hidden behind a roll of wax paper, and who knows where and when the jumbo can of yams was bought. To rescue bland canned yams, the Chef mixed a flavorful sauce of whiskey, cinnamon and nutmeg, then oven baked for half an hour. 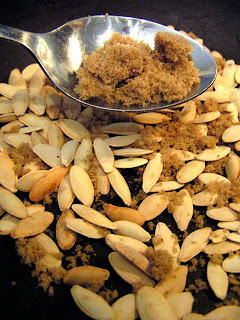 A crunchy contrast in flavor is provided with the addition of pumpkin seeds sauteed with brown sugar. For the holidays, canned yams are a quick (no potato peeling) and tasty budget side. Heat liquid from the can of yams and mix cinnamon, nutmeg and an airline bottle of whiskey. 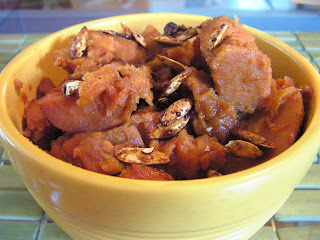 Pour liquid over yams and bake in an oven-proof dish for half an hour at 375 degrees. In a skillet, mix pumpkin seeds with a heaping tbsp. of brown sugar over a low to medium heat. Stir and cook until sugar melts and seeds begin to brown, about 10 minutes. Place seeds in a shallow bowl to cool. Sprinkle a few pumpkin seeds over each serving of yams. Store bought egg nog is too sweet and rich for The 99 Cent Chef, so he came up with a delicious recipe that uses 2% milk and a minimum amount of sugar. This recipe is a simple and festive start-up to your holiday; especially tasty when trimming your tree. 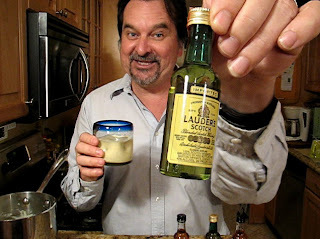 However be careful and do not get carried away -- those small airline bottles of booze mixed into an egg nog carry a kick, as the second half of the Chef's new video will attest. Each ingredient cost 99.99 cents or less, even some of the airline bottles (though the Lauder's Scotch in the video was $1.29 a bottle), and dried spices are always for sale at local dollar stores and markets. So pour yourself a 99 cent Homemade Egg Nog and enjoy the Chef's new value-added two videos in one. Play it here. The video runs 5 minutes 12 seconds. 99 thanks to neighbor Pete for his clever contributions. Click here to view or embed video at youtube. *One ornament was broken and two fuses were blown in the making of this video. 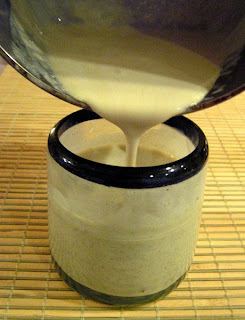 2 cups of 2% milk - or 1 cup milk and 1 cup of half and half cream for a richer nog. 1/4 teaspoon each of nutmeg, vanilla extract and cinnamon. 1 airline 99 cent bottle of rum, Scotch, or brandy. Heat 2 cups of milk over low/medium heat (do not boil) until it starts to low simmer - about 3-5 minutes. While milk or cream heats up, separate egg yolks in large bowl, add sugar and whisk together for a minute to mix well. Add one cup of the heated milk to yolk mixture a little at a time while whisking. After milk/egg is incorporated return to heated pot of milk and continue cooking. Make sure egg nog does not boil, and keep lightly whisking. The egg nog will thicken slightly after about 10 minutes. Turn off heat and set aside, if you, like the Chef, enjoy warm nog - or you can refrigerate. The egg nog mixture will finish thickening as it cools down to a milkshake consistency. Add as much or little of an airline bottle of booze as suits your taste - my Homemade Egg Nog is good with or without alcohol. All manner of cheeses are found in the 99c only Store. 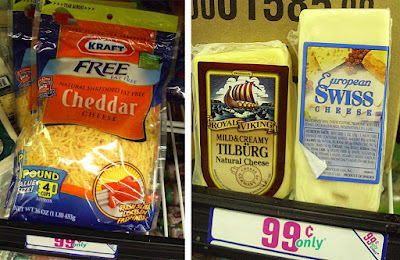 California Monterey Jack, European Swiss, Netherlands Tilberg, Austrian "Alps," American style cheddar and mozzarella have been found in the deli cold case by The 99 Cent Chef. Not that all these show up every time a visit is made - but at least once a month I find a good deal. I always pick up a few packages to freeze and use at a later time. If you are melting the cheese, freezing does no harm. While I is no "affineur," the fromage purchased in 99c only Stores has served me well indeed, from taco truck shrimp quesadillas to rainy day grilled cheese sandwiches, omelets to pastas and of course, oven baked macaroni and cheese. And I kick up the ultimate comfort entree a notch by blending three different cheeses. Adding an intense European Swiss, or Tilberg, gives a typical mac and cheese extra bite. 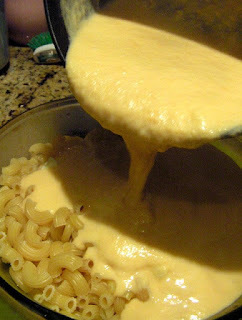 I also like to sweeten my Mac & Cheese by adding some white wine or apple juice in the mix. So always peruse the deli case for cheese deals, but beware of "vegetable oil" based cheese -- even The 99 Chef Chef has standards! 16 ounce elbow macaroni - substitute rigatoni or penne tube past to impress. 8 ounce each of cheddar, swiss and mozzarella - or any type you like. 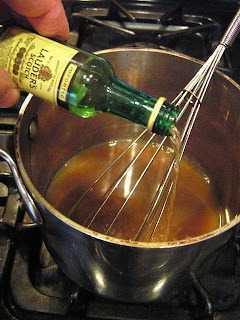 1/2 cup white wine - Okay to use apple juice. 1 tablespoon Dijon mustart - or 1 teaspoon dried mustard. Okay to use regular mustard. 1 cup bread crumbs - optional. Start by boiling macaroni in a pot for about 5-7 minutes until al dente. 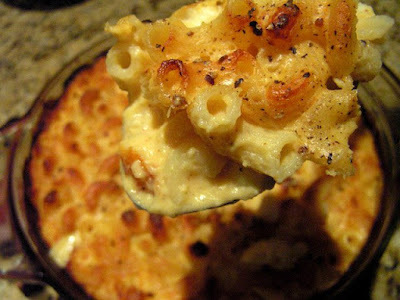 You don't need to cook the macaroni all the way - you will finish cooking it in the oven. When done drain macaroni and add it to a baking dish. Pour in white wine or apple juice. 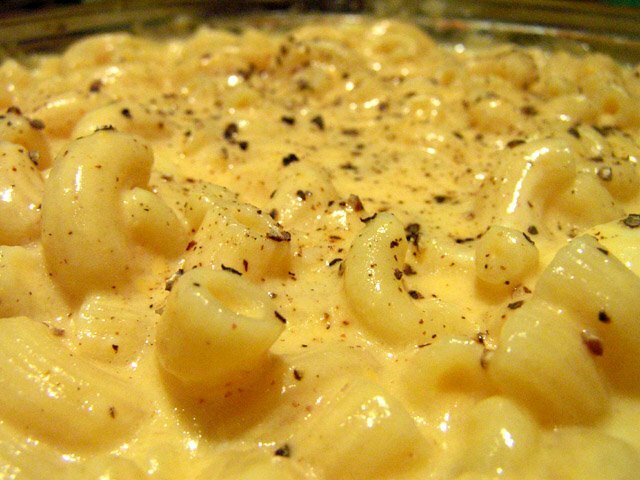 Set aside about 1/2 cup of cheese for topping. In a pot over medium heat, add flour and slowly whisk in milk. Sprinkle in cheese, stirring until melted, about 10 minutes or so. In a large casserole dish mix macaroni and melted cheese mixture and sprinkle extra cheese over dish. Finally top with bread crumbs (optional). Bake uncovered for 20-30 minutes at 350 degrees until top is golden brown. Remove from oven when done and allow to stand for 5 minutes as sauce thickens. *If too dry, make a split down the middle and pour in a 1/4 to 1/2 cup of milk. Next up is my festive holiday video "Eggnog and Trimming the Tree". So come back to sample my homemade spiked concoction using fresh ingredients and an airline bottle of booze. This budget mixologist sacrifices sobriety to bring you a cocktail recipe, while segueing into a Christmas tree decorating fiasco! 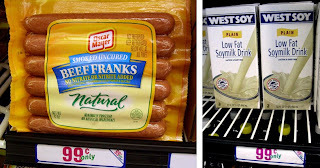 An often voiced complaint -- discount prices mean junk food recipes. Wrong! The 99 Cent Chef listens and is concerned about your health and well being -- he wants his visitors to be around for a long time. Fresh produce is abundantly stocked in 99c only Stores and the Chef uses organic vegetable stock whenever possible. 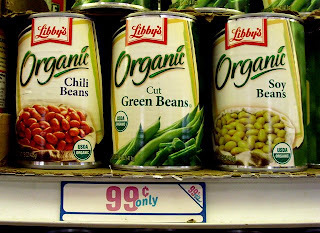 Now, you will not find Mache Blend salad containers, a carton of organic French onion soup, or a package of wheat tortillas every visit, but cans of organic tomatoes and legumes are usually stocked; also, cartons of soy milk and organic chicken stock turn up weekly. 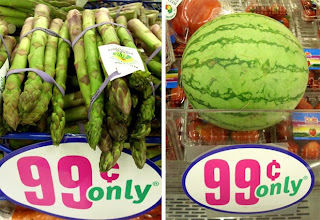 So keep a lookout for "99.99 cent organic." Here are just a few wholesome purchases made this year. 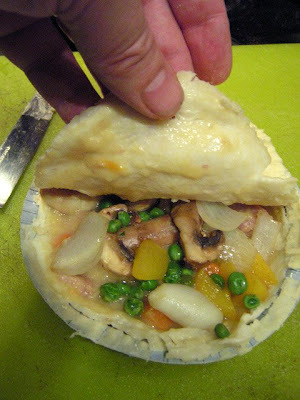 Many years ago in the Chef's bachelor days, a favorite late night winter meal was a couple of frozen pot pies. His frozen pie preference was Swanson. 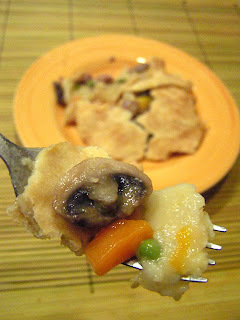 More expensive than Banquet pot pies (Banquet uses processed cubed meat), the extra quarter in price was worth it. 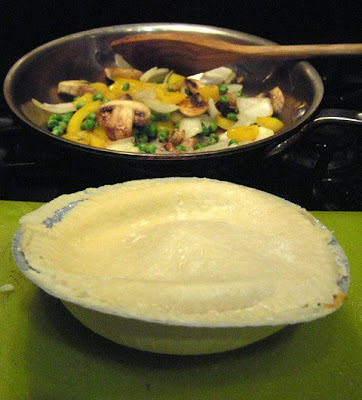 After a few years, even pot pies get boring, so the Chef came up with veggie variations - - allow the frozen pot pie to defrost a little, lift off the crust top and add a sauteed sliced mushroom with some chopped onion, garlic, bell pepper and a few frozen peas. Very simple, inexpensive and quick to do, perfect bachelor food for the future chintzy chef. 1/4 cup total of chopped veggies, including onion, bell pepper, frozen peas. The Chef is a Francophile. 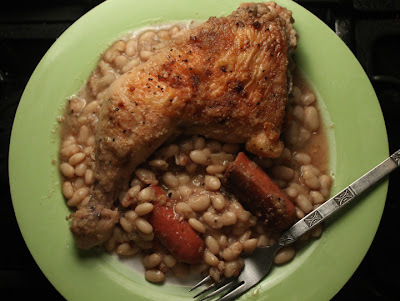 I like movies by Jean-Luc Godard, ye-ye pop music by Serge Gainsbourg, pommes frites (yes, French fries), and Cassoulet: a slow-cooked hearty bean dish. One of my early L.A. jobs in the Biz was as a videotape editor. Lunch was often in a neighborhood restaurant run by a charming French couple. My favorite dish was a comforting plate of Cassoulet. It reminded me of a rustic home cooked all-in-one dish: a bean casserole version of Mom's Cajun rice dish, Jambalaya. A classic Cassoulet is made with confit duck legs, sausage and white beans. I've yet to find duck for 99c or less a pound but chicken quarters from a local Latin market do fine; as for sausage, 99c only Stores always carry it. A French mirepoix of veggies include: onion, garlic, bell pepper, carrot and celery. They will sweeten this stew with slow cooking on the stove top and in the oven. For a vegetarian version, you can add more large cut veggies (carrots, potato) and leave out the meat (veggie stock instead of meat flavored bouillon,) but still bake it and top it with bread crumbs -- baking sweetens and intensifies the flavor of veggies and beans. 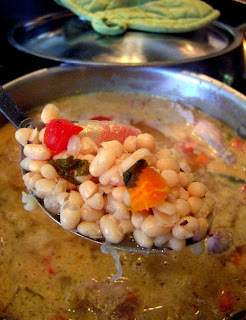 Cassoulet can be a clean-out-your-refrigerator-of-veggies dish (I like to add more veggies than normal recipes call for). On a cold winter day, try out this simple baked bean entree that tastes even better reheated the next day. The 99 Cent Chef's Cassoulet would make Julia Child proud. 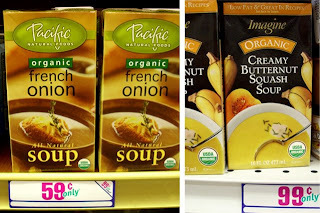 1 cup 99.99c white wine or vegetable broth - optional. 1 chicken or beef bouillon cube or powdered ( one tbsp.) - optional. 1 tsp. dried thyme or any favorite fresh or dried herbs. 2 cloves garlic - peeled and chopped, or 2 tbsp. crushed garlic. 2 - 3 chicken leg quarters or about 4 - 8 chicken pieces including breast, leg, thigh and wings. 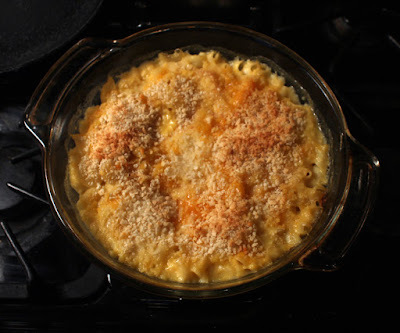 *A nice touch is to add a layer of bread crumbs (about 1/2 cup) on top during final hour of oven baking. 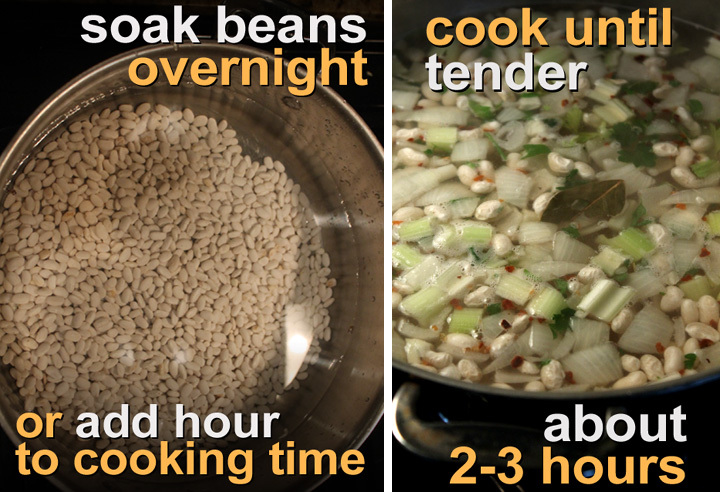 Soak beans overnight in 8 cups water (or add an extra hour of cooking time to unsoaked beans). In a large pot (I have one that doubles for baking), add white wine (optional,) chopped veggies, herbs, chicken or beef bouillon (optional,) bay leaf, garlic, salt and pepper. Bring beans to a boil, cover and continue cooking over low heat until beans are tender, about 2 to 3 hours. Lately I've been adding greens. 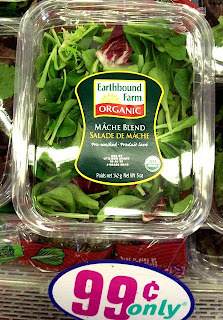 For quick-cooking spinach, or Swiss chard, add these when you start baking the sausage and chicken. For slower cooking collard, or mustard greens, add during the last hour of boiling beans. Preheat oven to 350 degrees. 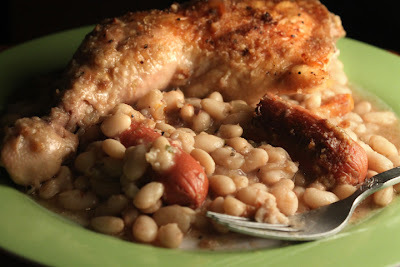 Add chicken and sausage to cooked beans. Cooked uncovered in the oven for about an hour and a half until chicken is done (double check by piercing with a fork and juices run clear,) and liquid is reduced. Add water if liquid cooks out. I bake the chicken skin side up and I add a pinch of salt and pepper to the top of the chicken pieces. That way the skin is crispy and well seasoned when done. You can also remove the skin for a lighter Cassoulet. The sausage may need to be turned if it starts to blacken or brown too much. For a thick sauce whisk together 1 tbsp. of flour into 1/2 cup of white wine or water and add to Cassoulet during last half hour of baking. You can also just mash some of the cooked beans and stir into Cassoulet. If you top with bread crumbs during the last hour, the sauce will thicken on it's own -- so no flour is needed. Cassoulet freezes fine, so don't let the large amount deter you. And it's the type of meal you can return to the next day - it will be even better!